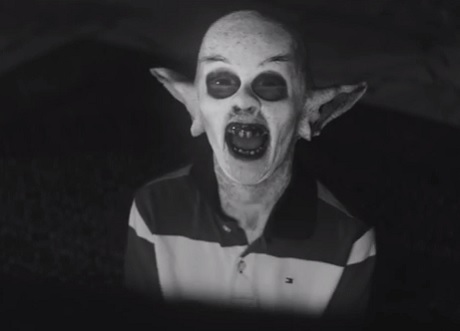 Bat Boy has been a fixture of tabloid culture for so long that, amongst our love for scandals and sensationalism, we have basically forgotten a key component of the freaky-looking figure: he's still just a kid. Hoping to rehumanize the child are Mounties/Hot Hot Heat member Steve Bays' Fur Trade, who have fit their "Same Temptation" single with a highly dramatic look into Bat Boy's apparently awful day-to-day. Home life can be tough, with the bald, bulgy-eyed youth's mom feeling more comfortable locking him in the basement then letting him watch cartoons. Bat Boy has a few tricks up his sleeve, though, and knows how to escape the house to hang out with his blind best friend. There are some sweet shots of the pair smashing up junkyard cars, but the rest of the neighbourhood seems less inclined to keep things cordial with the character. Scored by Fur Trade's nocturnal new wave, you'll find out who the real monsters are in the "Same Temptation" video down below. "Same Temptation" appears on Fur Trade's 2013 record Don't Get Heavy, which is out now via Last Gang Records.